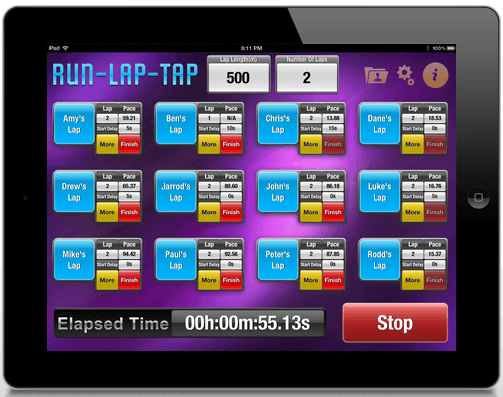 Designed for PE Teachers and Coaches, this iPad app enables the tracking of up to 12 runners times and other vital statistics. Start by entering in the lap length and the number of laps your runners are to complete. Users can then choose to start all runners off at once or nominated and use a “start delay” value for handicapped races/training. As the runners complete a lap simply tap their name, to update the lap splits, speed, pace and much more for that runner. At completion of the race, you can email the results or archive them inside the app for review. A great app that enables the user to complete the class 12 Minute Run fitness test by simply placing the device in their pocket and running. There is also the Multi User mode. In this mode you can test up to 5 athletes simultaneously. Each time the athlete completes a lap of the track, you press the runners name to accumulate distances. The app then uses to the average speed of the runner to calculate predicted distance, while updating accurately when they cross the lap. The HD version enables the simultaneous tracking of up to 20 runners. A super collection of challenge based Basketball Skill cards. Students can sort through the cards, which outline the skill and the target to complete various levels of difficulty. A great way to move students towards a more student centred, self paced environment within practical activities. This wildly popular app has been completely redesigned based on your feedback. With over 20,000 downloads in the last 6 months, it sure has become a great way to capture and assess physical skills within PE. Users can now setup and import class lists and rubrics for enhanced data entry. For those of you who already have the original version of the app, you can update for free on your device by visiting the app store app . Check out the other top app lists here – Part 1 – Part 2 – Part 3 – Part 4– Part 5 – Part 6 – Part 7 – Part 8 – Part 9 – Part 10 – Part 11 – Part 12 – Part 13 – Part 14 – Part 15 –Part 16 – Part 17 – or grab the PE Apps app for a great one stop collection of the best PE apps. Watch out for the finish line photo app – it doesn’t have a way to reset or turn the timer off – it just keeps running and running – very annoying. To reset the timer, you simply need to tap it which will bring up the option to “Start clock from zero”. This will restart your timer. Your task as a timer is to press this when the race commences. From that point you need to press the take button when the athlete crosses the line. I am starting a fitness program here at my school. It’s never been done here before. I have been looking through your blog, what a great find. Is there anything anyone could recommend, in terms of finding daily workouts, suitable for students aged 14+? perhaps apps? Thanks – I know how to restart it – just real hard to understand why it doesn’t have a reset or stop button so it isn’t constantly running. A minor flaw but one the developer should have fixed by now.